There’s no worse feeling than finding the perfect pair of boots only to find that they won’t zip up, or they are uncomfortable to wear! So, to save you from disappointment, here’s a round-up of the best wide calf boots for winter and fall! 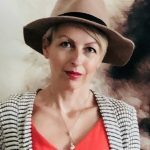 If you have a favorite brand or pair of boots, don’t forget to add your comments to this article so it becomes a definitive guide for other women too! Of course, everyone’s legs are a different shape and size, so it may take a bit of trial and error, and trying on lots of pairs before you find the perfect pair for you. You’ll want to make sure not only that they fit your calves well, but also that they are just the right height for you. I’m concentrating on knee-high boots here, as obviously you won’t have the same sort of problems with booties when looking at calf width. Just as Naturalizer are a great option for arch support shoes, the brand is also a good go-to if you’re looking for wide calf boots. You’ll find widths in medium, wide and extra wide, so you can find a pair with a snug fit but which don’t cut into your calves. There are classic riding boot styles, which won’t go out of style, so you can choose a pair of boots which will last you for years! 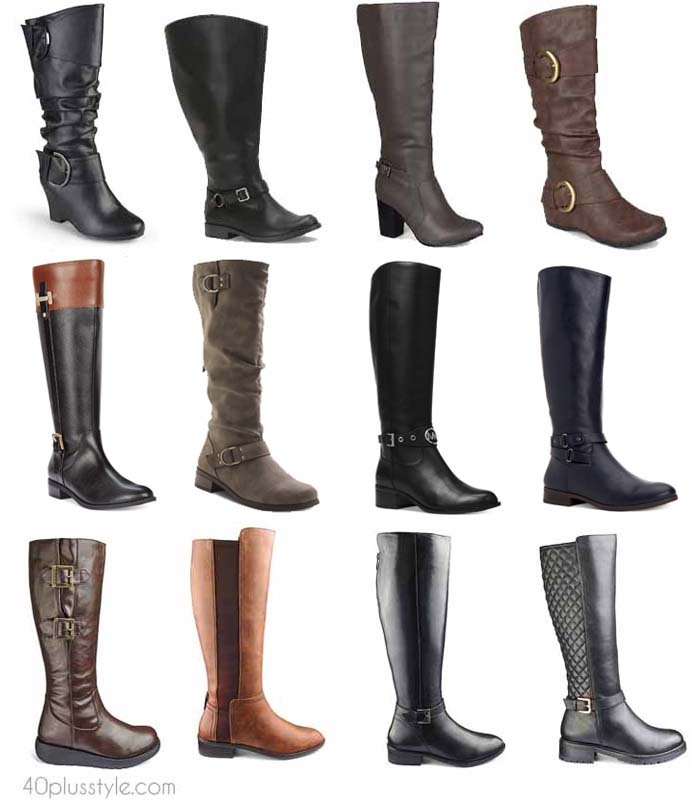 Zappos carries a big variety of brands with wide-fitting, and you can search by width to make it easy for you to find a pair of boots to fit. There are also width measurements in inches, so you can measure your own calf to make sure it will fit before you order! Another great multi-brand option, Nordstrom allows you to search by width, heel height and shaft height, which makes it easy for you to narrow down your boot choices. As well as being a good plus size option, Simply Be generally stocks around 20 or so knee-high wide-fit boots. Kohl’s offers another good way of choosing as you can opt for wide fitting or extra wide fitting. DSW (or Designer Shoe Warehouse) also allows you to search by width. It tends to act as an outlet, so you may well find brands including Naturalizer. But, you may find there aren’t all sizes available so best to snap a pair up if you see something you like! Often an overlooked option for fashion, Amazon is a good option if you’re looking for sizes which aren’t always available. Searching on such a vast fashion store will give you plenty of wide-fit options. Macy’s has wide-calf boots created just for the store, as well as brands like Frye and Vince Camuto. If you also need extra arch support then there are some great bootie options here. 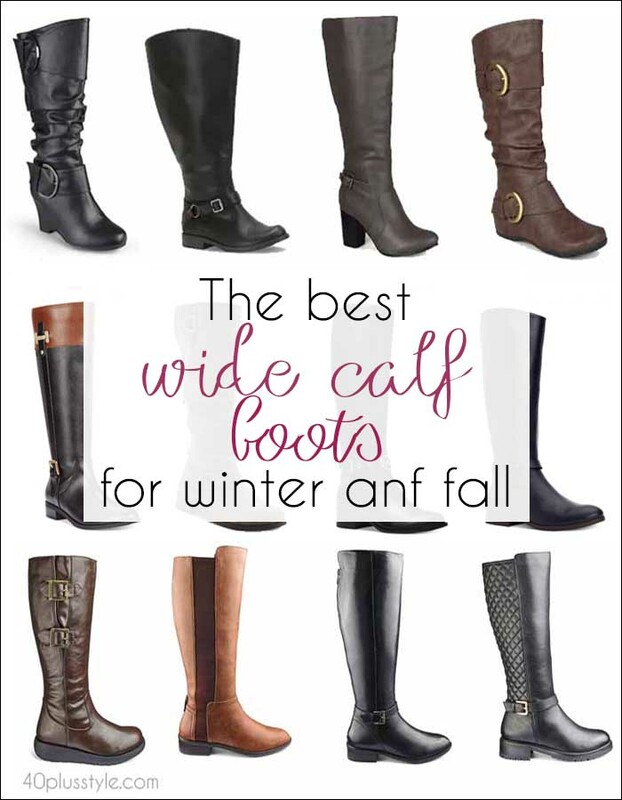 Hope you enjoyed this roundup of the best wide calf boots for winter and fall! We would love to hear your recommendations too. Do you need wide calf boots? Which are your go-to brands for comfort, fit and style? Next post: How to choose a coat – a complete guide for buying the right coat for your style this season!